Most damage can be repaired. It is important to get any repairs done quickly after breakages. 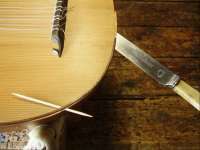 As with guitars, if there is serious damage it is usually better to reduce the tension on the strings. 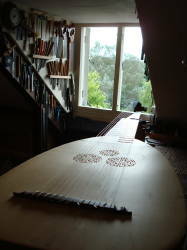 A new EMS theorbo just about fits on the workbench. 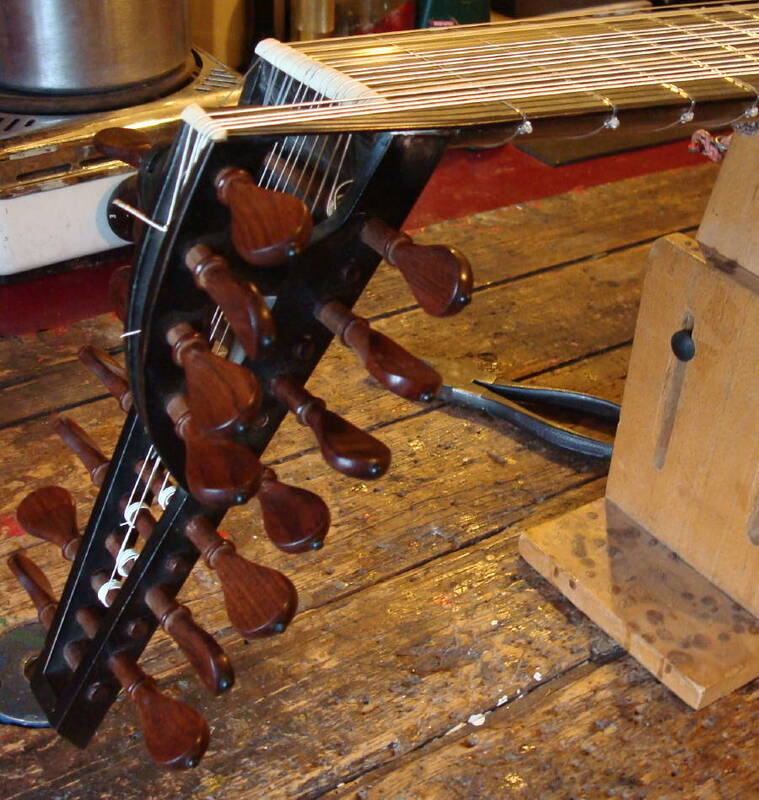 It's in for attention to pegs and frets. 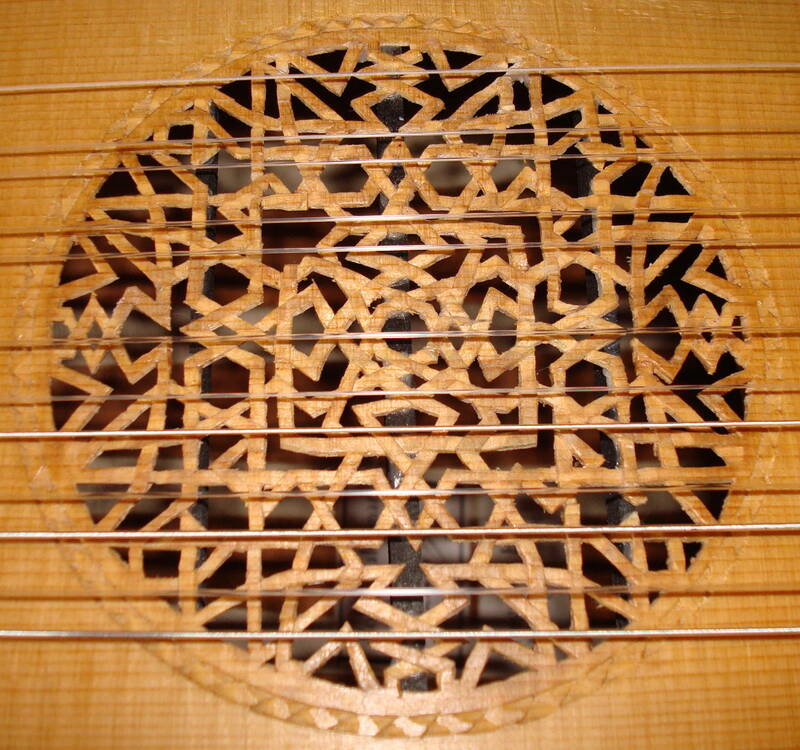 A Rubio Baroque lute that has been in the workshop many times. The pegbox needed to be re-attached to the neck a few years ago and more recently the owner wanted the neck re-fretted with nylon. 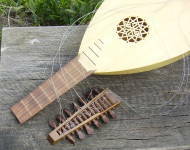 A 1980 Charles Ford student lute damaged by a fall. 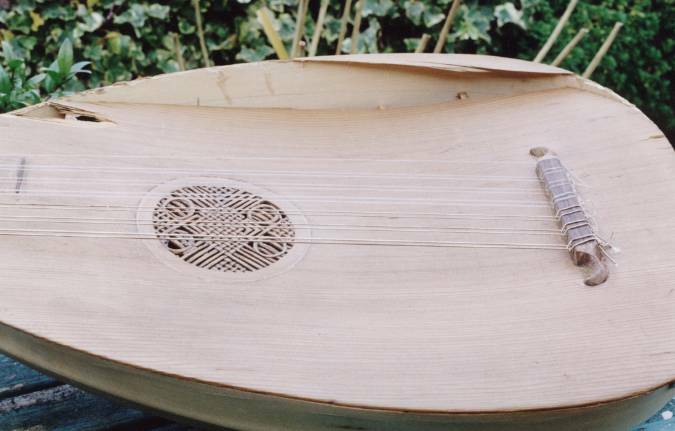 The soundboard-body joint at the rear of the instrument became unattached. Some of the edging was loose and some was missing. I glued up everything that was loose and replaced the missing edging. 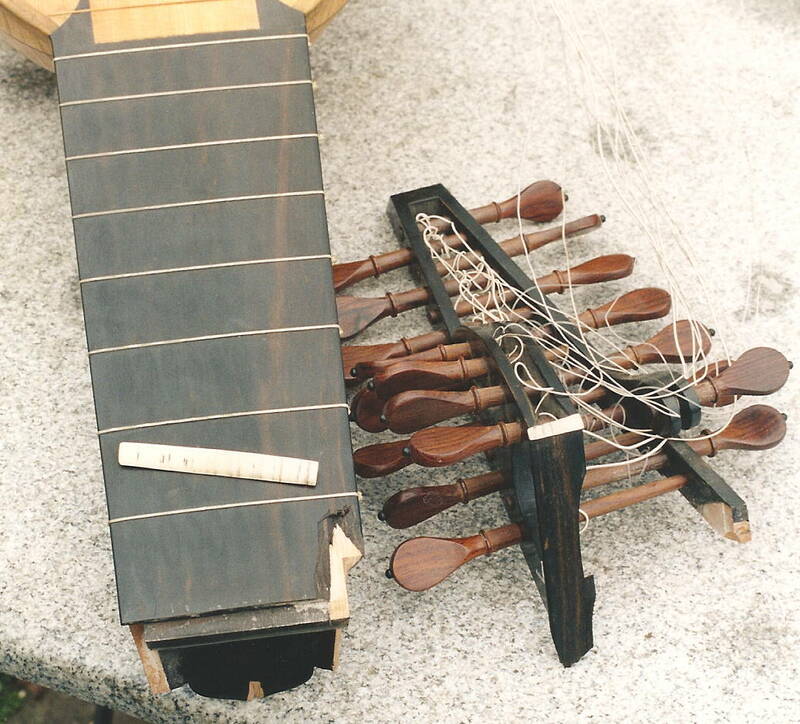 A 1972 lute with a soundboard damaged by a falling book. 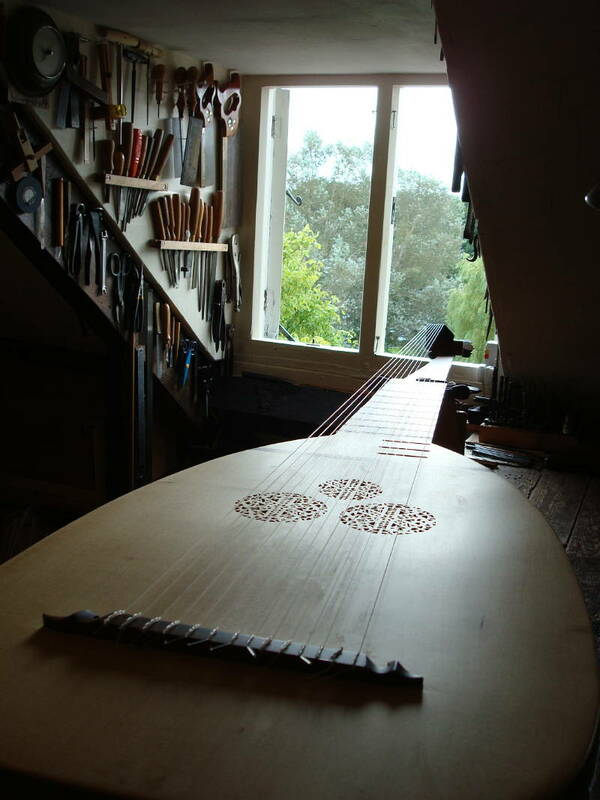 In centuries past the soundboard would have been saved, repaired and re-used. 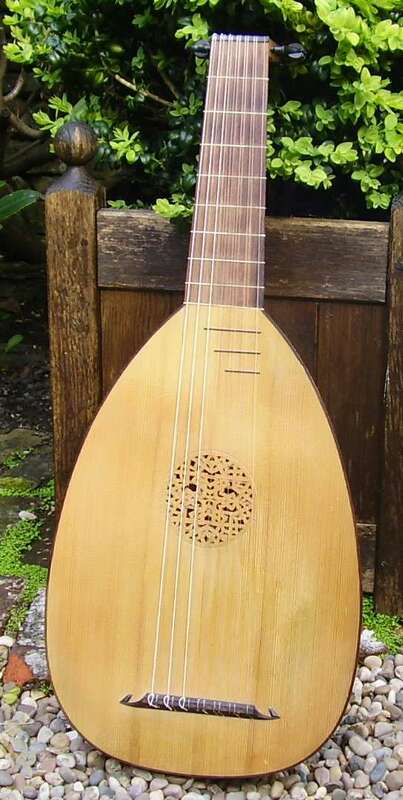 The soundboard of this lute was rather crude and not a faithful copy of the old lutes, so the owner chose to have a new soundboard with more traditional barring and bridge. 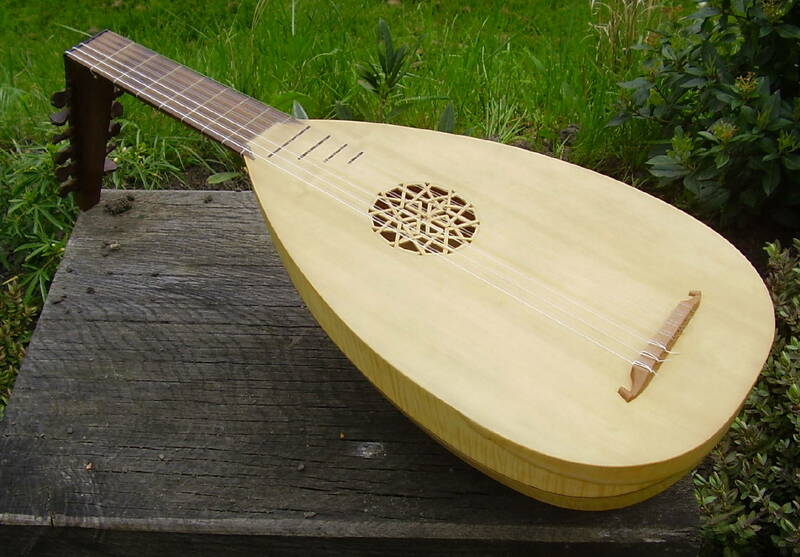 A Harwood and Isaacs lute purchased on Ebay in 2007. These lutes were available as kits and completed instruments in the 1970's and 80's. They were inexpensive and very good for their time. 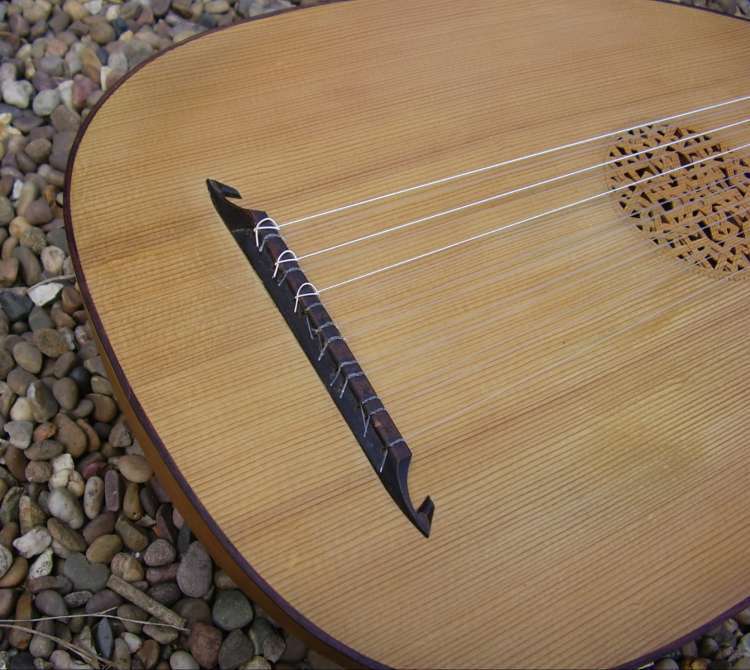 These days players can expect a more historically accurate instrument, but this lute will serve it's job well as a first lute for a guitar player. Unfortunately, shortly after purchase the neck and pegbox parted. The main expense was cleaning up the Cascamite glue which had been used in the original construction. The new glue-ing up was done with hide glue, which will be strong enough and easy to clean up if the same damage should occur in the future. New strings and gut frets were fitted. 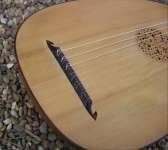 On this lute the rose continually suffered damage and was then poorly repaired with Copydex. I removed much of the white goo and reglued and replaced as many bits of the rose as possible. Though roses are fragile this type of damage is not common. Why did it happen? 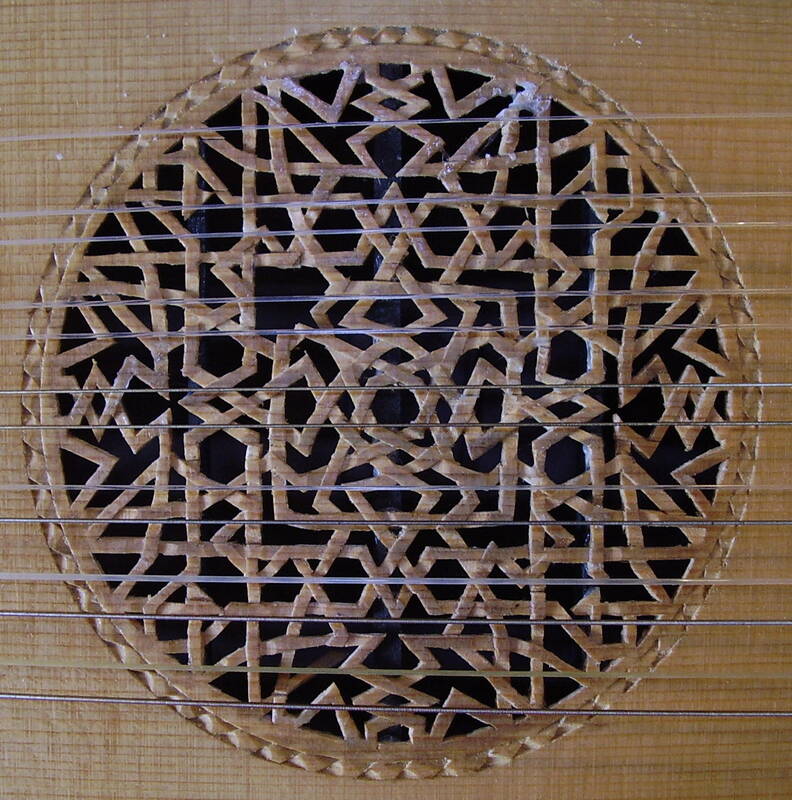 First, a close examination of the rose above right shows only 3 supporting bars beneath. The old roses had ten or more. Large portions of this rose are unsupported from beneath. 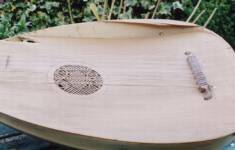 Second, the old makers always cut away the sides of the lute so that the rose was lowered. 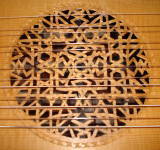 In this case the rose is higher, possibly raised further by a loose bar beneath the sound board. Players are not supposed to play directly over the rose but it is tempting as the sound is always warmer. The distance between the strings and the rose on this lute is very small indeed.